The annual test day organised by the UK’s Society of Motor Manufacturers and Traders feels a lot like how I imagine speed dating must feel. You stay in one place – in this case Millbrook Proving Ground in Bedfordshire – and race through a number of short, sharp getting-to-know-you sessions. Only it is cars rather than prospective life partners you are trying out for size. As with a speed date, each test is only really a chance to garner first impressions. Any annoying traits like snoring or the car equivalent – a maddening rattle – are unlikely to bubble to the surface. It all boils down to the immediate, instant appeal of various alternatives. As I take the Mini Paceman Cooper SD out for a spin on Millbrook’s undulating and twisty hill route, it’s a shame that it follows my prior speed-dating candidate, a BMW 3-Series GT that I wound up quite fancying. While the five-door BMW coupé is no beauty, it does provide great company on an interesting road. This three-door Mini coupé is much prettier but seems a little vacant in comparison. I’m sure the sporty diesel Paceman would feel better in isolation, or if compared with something less accomplished than a 3-Series. It does offer plenty of grip, direct steering, no shortage of urge, and a better quality of ride than I remember from any other Mini I’ve tried. The suspension on my car is less fidgety than usual because somebody wisely opted out of the sports suspension normally fitted to all versions of the Paceman when speccing this car. Softer springs are a no-cost option that I’d recommend choosing unless you feel the need to hop over every pebble. 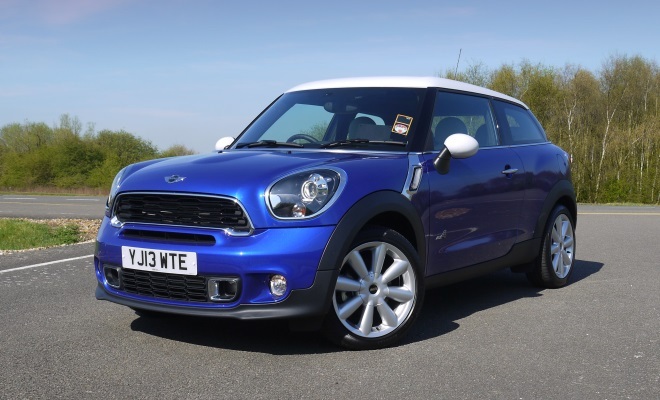 Paceman prices currently start at £18,970 for the plain petrol Cooper, rising to £25,530 for the Cooper SD automatic with All4 four-wheel drive. Prices across the range are around £800 more than the equivalent Mini Countryman, the more practical (and much more awkwardly styled) five-door model on which the Paceman is closely based. 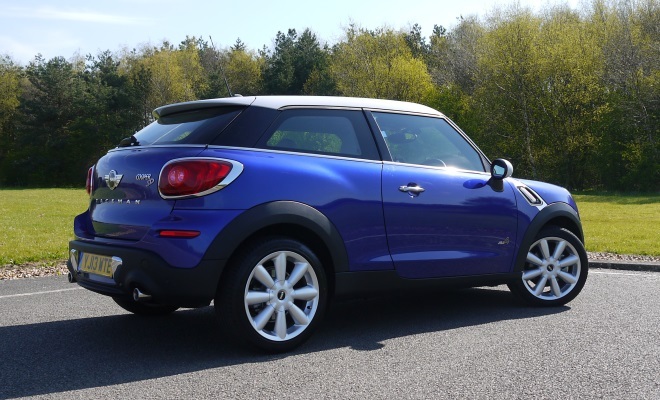 My particular Paceman Cooper SD All4 sits one rung down from the top of the 14-car range by virtue of its six-speed manual gearbox, with an on-the-road price starting at £24,290. A heap of extras has pushed the final bill up to £30,975, however, which might start to feel like a heck of a lot. 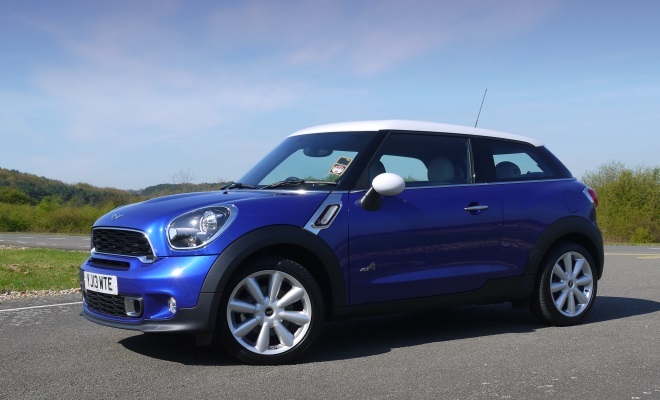 Most of the options seem exactly that to me – optional – given that the Cooper SD already boasts things like manual aircon, DAB radio, Bluetooth, a USB socket, 17-inch alloys and reversing sensors. I haven’t taken this 4x4 car off road, though I know from testing the All4 version of its Countryman cousin that Mini’s system is surprisingly capable in challenging conditions. An electromagnetic centre differential can vary the share of torque sent to the rear wheels from zero to 100%, while an electronic differential-lock system can brake individual wheels to channel torque across the axles, to drive the wheels with most grip. The setup is designed to tolerate a degree of wheelspin to prevent the car bogging down in very soft or slippery conditions. On the road, the same vectoring of torque can help to keep the car stable through corners. The Cooper SD’s 2.0-litre diesel engine generates 143bhp and a generous 305Nm of torque, though it adds a hefty 95kg over the weight of a petrol-powered Cooper S for a total of 1,465kg. That’s just 5kg less than the equivalent Countryman, despite the 4cm-lower roofline and two fewer doors. 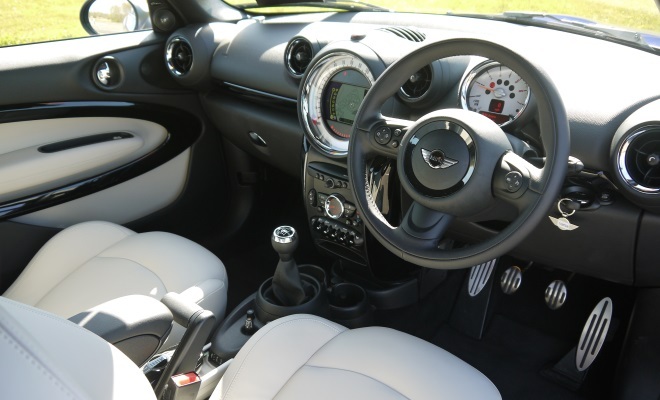 Inside, the Paceman replicates the interior of the Countryman including its questionable positioning of switches and daft dish of a central display, though the quality of materials is very good and the fit and finish superb. The central rail for holding clip-on extras like a sunglasses holder seems to have been fixed since I last sat in a Countryman. Things always rattled, a lot, but the rail hasn’t let out a peep in the new Paceman. Sixth gear provides a relatively relaxing 2,000rpm cruise at motorway speeds, and noise is perfectly tolerable all the way up to 100mph on the Millbrook bowl. A gruff engine note is more tiresome than the muted tyre roar, and wind noise is never intrusive. Surprisingly, for a coupé (officially the Paceman is a Sports Activity Coupé) the Paceman’s door glass is not frameless as it is in the smaller Mini hatchback. But the frames probably help to keep the cabin quiet. Sprinting to 62mph takes 9.3 seconds, about a second slower than the Cooper S model. The official combined cycle consumption is 57.6mpg and CO2 emissions are ranked at 130g/km – not too bad for a sporty 4x4. Brake energy regeneration through the alternator comes as standard, as does automatic engine stop-start and gearshift reminders. The plunging roofline may have fixed the Countryman’s bumpkin looks, but combined with the lack of rear doors it makes climbing in – and particularly out – of the Paceman a struggle for anyone other than the lithe-limbed, skinny and flexible. The car is not intolerable as a four-seater, though I imagine most buyers will probably use it as a two-seater with a pair of occasional chairs. The Paceman’s strongest card is probably its looks, which you may love or hate according to your own tastes. 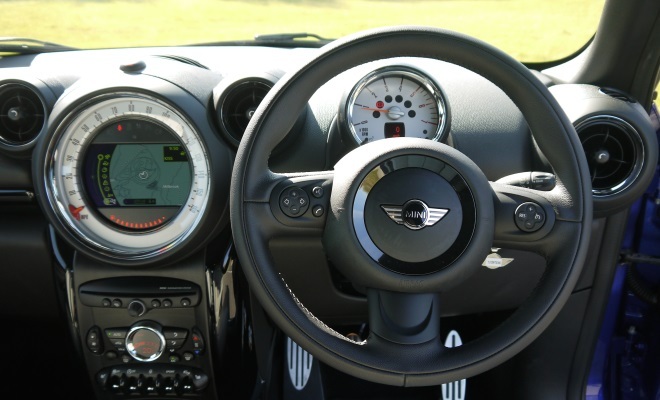 It’s certainly easier on the eye than the Countryman, which seems cartoonish and over-inflated from most angles, even though the Paceman shares identical styling forward of the windscreen. The rear lamp clusters that stretch forwards onto the flanks are a big help in eradicating the Countryman’s awkward rear end, while the shapely ripple over the rear wheel suggests muscularity rather than bulging flab. Beyond these surface details, the Paceman shares most of the highs and lows of the Countryman, which can be an annoying car but also a great deal of fun.